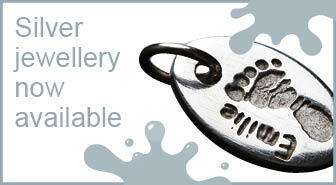 Carry your child’s handprint or footprint with you every day with our new selection of fine leather accessories. Paint and Glaze is a mobile pottery based in Rugby, Warwickshire, UK. 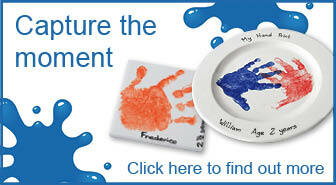 We provide a wide range of blank pottery items for you to paint. Then we fire them for you to collect and cherish. You unleash your creativity on the pottery and we make sure you have a durable ceramic item to treasure. Pottery painting has universal appeal, making Paint and Glaze a great addition to parties for children and adults alike in a location of your choice. You can create your own artwork or the hand or foot prints of those you love on a plate or mug, leaving you with a personal gift for someone special. Holding your event in a school, nursery or your home could not be easier. We’ll bring everything you need except the table and chairs! If you are a small group, you can have Paint and Glaze come to your home or you can come and join us at one of our open events that we organise around the local area. 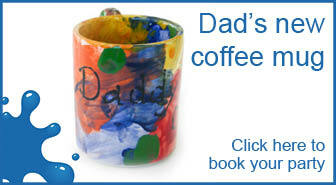 It’s very rewarding and a great, fun way to spend time resulting in your own personalised pottery. We provide everything you need from non-toxic paint to brushes – even inspiration when required.We offer a friendly and personal service, not to mention a wonderful selection of ceramic items for you to choose from.